Wouldn't it be sweet to stand the test of time and still be together as a couple after years to come? It truly is but starting young might be worrisome to the parents especially that teenage pregnancy is rampant. Yet here's a couple who graduated together for three times and are still manage to be together. It's something of an achievement since they are not only focusing on their love but also in their studies. The perfect balance. 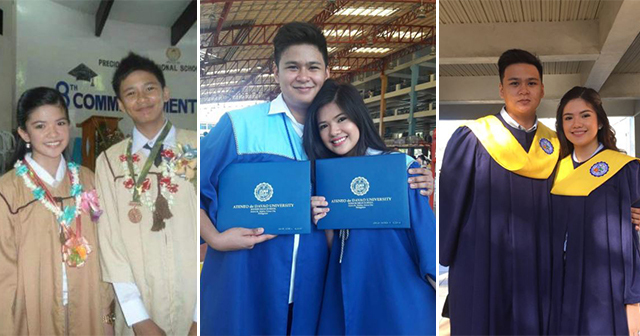 Couple Janica Eleria and Vande Alagao, used their love as an inspiration to finish school and help each other in their studies. It must have been a challenge, but the couple fought on. They both met in Grade 2, where Janica was a newly transferred student in Precious International School of Davao, which was Vande's school. Apparently, Vande could still remember what Janica wore on that day and the cellphone she had. It must have truly been love at first sight! They eventually became friends and began texting and talking to each other in fifth grade. By October at their Sixth grade, Vande asked Janica, and they officially became a couple. However, Janica remained in their school as they entered Highschool while Vande transferred to Ateneo de Davao University. Their schools were actually near to one another, but they admitted that they rarely see each other because of the school activities. Good thing Janica's parents approved of Vande so, in her third year of Highschool, Janica was able to transfer into Vande's school just in time so that they could graduate together. They also finished Senior Highschool in Ateneo and was able to graduate together for the third time! It truly is an inspiring love story, and such true love should not hinder their partner's success. We only hope they could graduate together for the fourth time. It is exciting to hear their story in the future. Maybe forever do exist.